Pets account for millions of pounds worth of economic activity in the UK and may reduce National Health Service (NHS) costs by nearly two and a half billion pounds, according to a new report. Drawing on multiple sources, and written by internationally respected animal welfare and business experts, Companion Animal Economics comprehensively documents the economic impact of pets in the UK – the first time such an assessment has been made for nearly 40 years. The study directly examines available evidence on the direct and indirect benefits and costs of companion animals to society, including their influence on human mental and physical health, illness prevention and well-being. Published by CABI, Companion Animal Economics was developed by Daniel Mills, Professor of Veterinary Behavioural Medicine at the University of Lincoln UK, and Dr Sandra McCune, Human-Animal Interaction expert at Mars Petcare’s WALTHAM Centre for Pet Nutrition. Mars Petcare UK provided sponsorship towards the cost of producing the report. Other authors include Dr Sophie Hall from the University of Lincoln’s School of Life Sciences, Professor Ted Fuller and Luke Dolling from the Lincoln International Business School, and Katie Bristow-Wade of Dogs for Good. Relatively little information on the economic impact of pets has been published since the 1988 seminal Council for Science and Society (CSS) report on Companion Animals in Society, which inspired Companion Animal Economics. 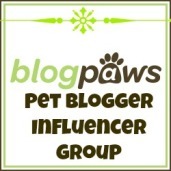 Since then, trends in pet ownership, and associated industries, have changed a great deal. The report’s methodology sought to capture this new context, including issues like pet tourism, pet obesity, and expanding veterinary services, identifying clear gaps where further high-quality data and additional research are needed. When evaluating the contribution of companion animals to the UK economy, both positive and negative aspects were considered. The cost of NHS treatment for bites and strikes from dogs is estimated at £3 million per year. At the same time, the report also estimates that pet ownership in the UK may reduce use of the UK health service by up to £2.45 billion per year. This conservative conclusion is drawn through examining healthcare savings through reduced number of doctor visits. Given the scale of the potential impact, the report concludes that research into companion animals and their economic impact on society needs further investigation and should be supported by government. While UK data were used in the report, many of the points raised relate to other industrialised nations, demonstrating the global nature of this issue. The Human Animal Bond Research Initiative (HABRI) Foundation partnered with Cohen Research Group to conduct an online survey of 2,000 pet owners, which had a margin of error of plus or minus 2.2%. This is the first survey of its kind to explore how pet owners’ knowledge of the health benefits of the human-animal bond impacts pet care and welfare. The survey also looked for generational differences among pet owners on this subject. The majority of pet owners have personal experience with the health benefits of pets. Knowledge of the scientific research on the benefits of the human-animal bond improves animal welfare. Knowledge of the scientific research on the benefits of the human-animal bond boosts pet ownership. Veterinarians are trusted resources for scientific information on the human health benefits of pets and have an opportunity to further strengthen their relationships with pet owners, especially millennials. Doctors can also benefit from increased communication on the human-animal bond. Pet owners believe society should be more pet friendly and should act on the scientific research that shows pets improve human health. The Centers for Disease Control and Prevention (USA) recommends that adults of all ages should engage in 150 or more minutes of moderate physical activity per week. Among adults 60 years of age or more, walking is the most common form of leisure-time physical activity because it is self-paced, low impact and does not require equipment. Researchers at the University of Missouri have determined that older adults who also are pet owners benefit from the bonds they form with their canine companions. Dog walking is associated with lower body mass index, fewer doctor visits, more frequent exercise and an increase in social benefits for seniors. 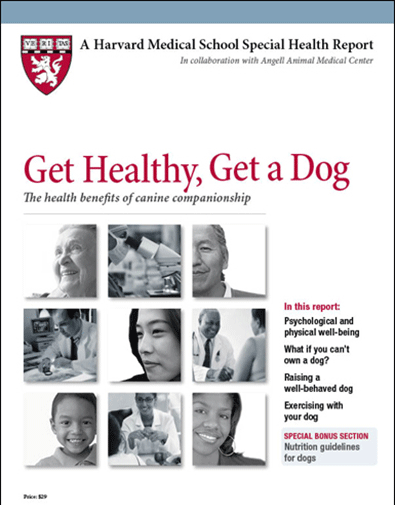 The Harvard Medical School has published a special health report entitled Get Healthy, Get a Dog: The health benefits of canine companionship. The report details the many ways that dogs can improve the lives of humans. The report can be purchased in print (US$20), in .pdf electronic version (US$18) or both (US$29) from this webpage. I’m pleased to see this type of publication coming from such a reputable institution. Dogs and humans both benefit when humans take responsibility for a committed and healthy relationship. I particularly like that the report also covers grief, since we all will face grieving the loss of beloved pet (given the odds – since we live a lot longer than our dogs do).